In New England, Valentine’s Day is inexorably linked to the weather which is usually snow, sleet or ice. I started making these necklaces during the weekend of the Martin Luther King holiday. Ice was the weather horror of that weekend. With a forecast of snow followed by rain followed by single digit overnight temps, I planned for a forced two-day homestay by shopping for tasty food. I stocked crab cakes, cod which I cook Mediterranean style, lobster meat for a Lobster roll as well as sautéed over angel hair pasta. I did not forget Chardonnay and Merlot! The three necklaces shown below were strung on the sofa in front of a fire with the dog Max curled up on his spot. It was a pleasurable two days with no broken bones since the furthest I went was to the deck gate to let Max out…after pouring hot water to defrost the gate latch. I decided to string simple seed beads and save the excitement for the dangles that are such fun to assemble. Descriptions follow, left to right. Red glass “pony” (a big seed bead) necklace, 22” long with a gold metal heart clasp. Dangle of 4” with large gold metal circle as the connector. 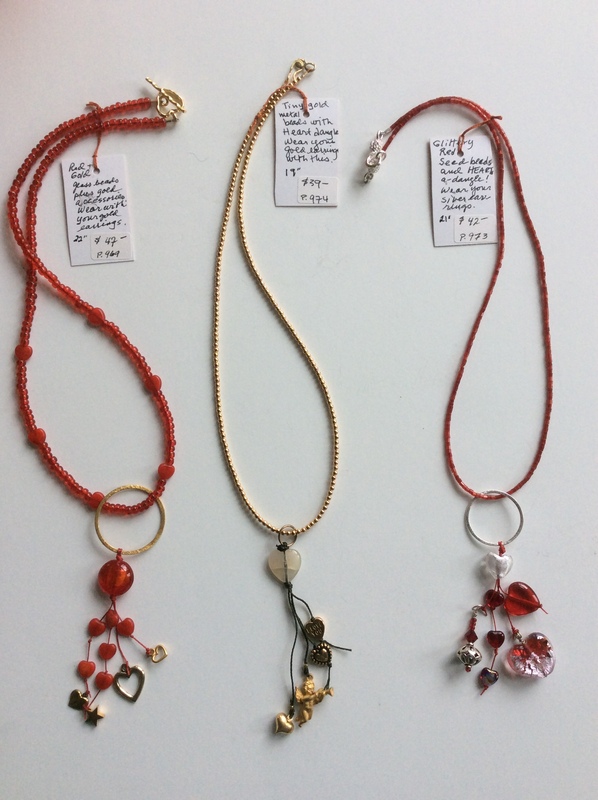 Featured beads are Murano red glass with foil interior; red glass hearts and assorted gold metal charms. $47. Small gold metal round beads make the 19” long necklace and simple hook and eye clasp. Dangle of 3.5” featuring an off-white heart plus 4 gold metal hearts plus an angel making music. $39. Sparkling red glass seed bead necklace, 21”, with a creative silver metal clasp. Dangle of 3.5” featuring two Murano foil glass hearts, assorted red hearts and a sterling silver and crystal small dangle. $42. 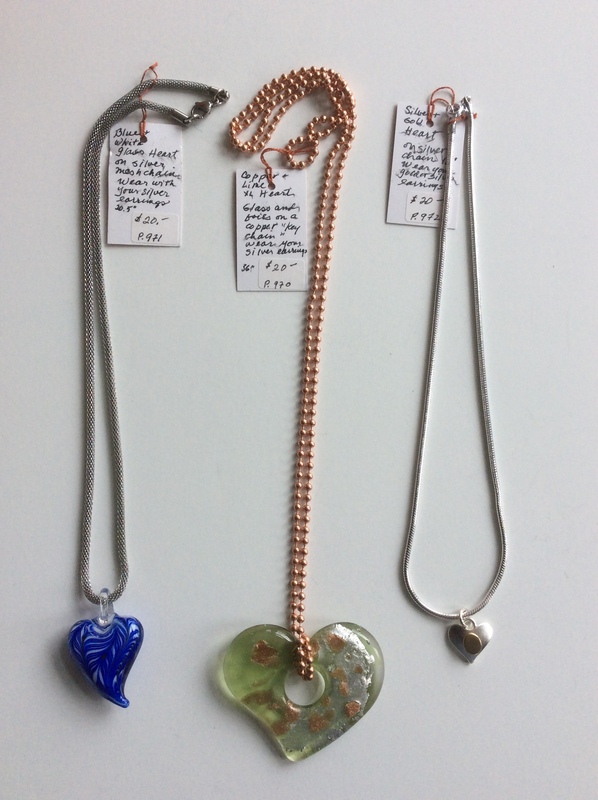 A search of my “HEARTS” box produced three gems that I could just put on a chain and present at a low price because my labor is negligible (unlike stringing those seed beads). I show them in the second photo. Again, from the left. Blue and white Murano glass bead on a 20.5” on a silver mesh chain. $20. Large (2.25” wide by 2” high) lime green with copper and silver foil designs embedded on a 36” copper “key chain” which I (or you) can easily make shorter. $20. Simple and contemporary 18” silver chain with a stylized silver heart and gold patch. $20. Certain dog-loving readers have asked for more Max photos. I shall graciously let him steal the spotlight every other month. 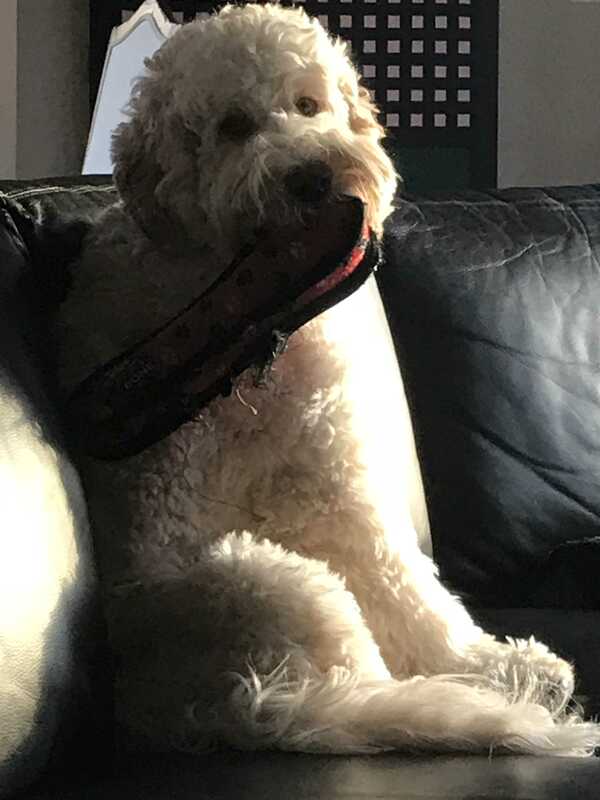 This is Max on the sofa, which is for play as well as rest in his mind. He is just shy of 9 months of age. 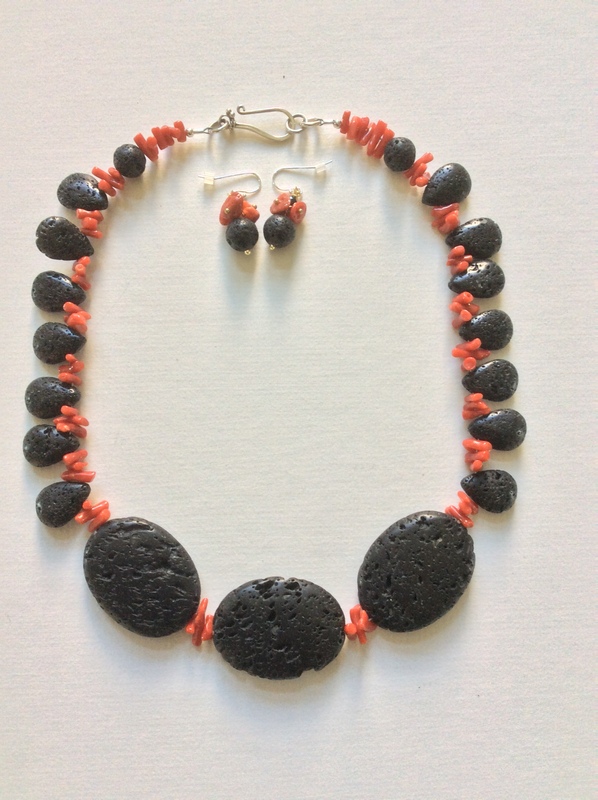 BLACK LAVA BEADS OF SICILY WITH CORAL. I’m not sure if I mentioned I spent a week in Sicily in early April. My reason for flying into Palermo after four lovely days in Rome was to meet up with a group from Oldways, a Boston firm very interested in nutrition and a sponsor of Culunarias, aka cooking classes in interesting parts of the world. Sicilian cooking is living history born out of serial conquest. Each wave of conquerers has shaped the Sicilian table. The Greeks came bearing gifts of honey, wine, ricotta and olives, followed by the rapacious Roman cultivators of wheat and grains. After invasion by the Vandals who introduced meat dishes, a return to Greek Byzantine rule boosted local agriculture with the establishment of monasteries across the island, bringing their taste for sharp cheeses and spicy biscuits. North African Arabs and Berbers brought citrus trees, spices, nuts and, yes, dried pasta and coffee beans. Here is a summary of what we did: we lunched with Mary Taylor Simeti (1); drove to the rural wine estate of Regaleali and had our farmhouse lunch made in front of our eyes at the Anna Tasca Lanza Cooking School (2); we ambled around Palermo’s daily fresh market on a street food tour (3), eating five specialities and finishing at the lively Taverna Azzurea with local wine to sip! We drove south-central to Agrigento, an ancient Greek city, quite intact, with an acropolis, viaduct, and temples galore. Then we finished our stay at Ortigia, a lovely island reached by a short foot and auto bridge, very close to Syracuse and Mount Etna, where our new best friend, Chef Maurizio Noceo, guided us around his favorite vendors at the fresh market, showed us how ricotta is made and cooked our goodbye dinner at his restaurant Marcelle. In between, our expert guide/chef, Catherine Katz demo-ed a lunch of tasty but nutritious food and we toured Planeta Vineyards(4). Whew! A super-fast food tour. Now for the beads. I’ve been buying lava beads throughout my beading career, but never imagined I could find some Mt. 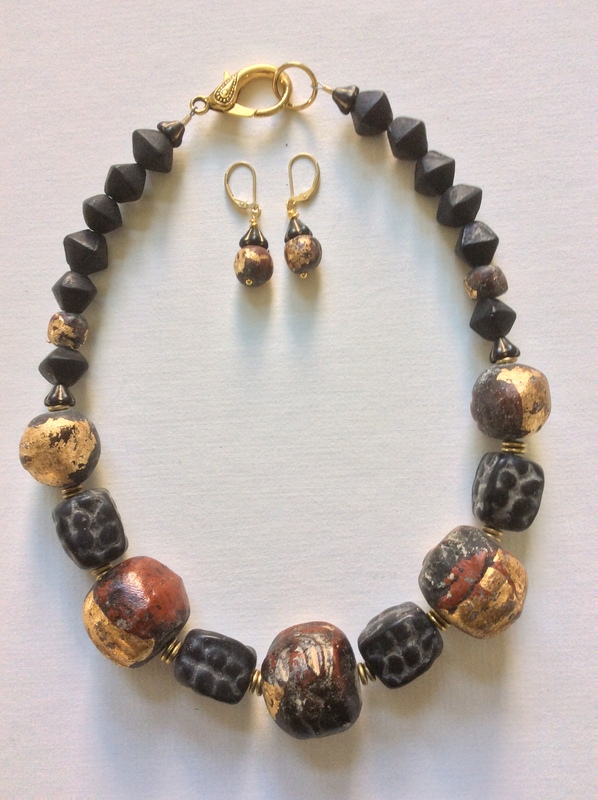 Etna lava beads on this trip. I also found the coral in the earrings there, but Sicilian coral was depleted in the 18th century, so this coral came from somewhere else. Interestingly enough, Mt. Etna was in an erupting stage while we were there. The necklace measures 19″ and is $69 for the set. It weighs 2.7 ounces. These prayer beads are made by Tibetans. I visited Tibet twice but it is becoming more difficult to find the true Tibet. Historically, Tibet covers the Tibetan Plateau, an enormous space bordered by China and the Himalayas, sitting mostly at 16,000′ altitude, except for Mount Everest which at 29,000′ is the highest spot in Tibet and the world. In 1993, I visited Lhasa with Don and bought many exceptional beads. I convinced Don to return a few years later: we spent some days in Tibet and then boarded a jitney to cross the Himalayas for two days to reach Katmandu, Nepal, which is currently home to many Tibetans in exile. In 1959 the Dalai Lama and many Tibetans fled to Dharamsala, India, and established a government-in-exile. During the Cultural Revolution, nearly one million Tibetans were killed and 6000 monasteries were destroyed. In the 70’s, China started relocating ethnic Chinese to Tibet in an effort to further dilute the Tibetan culture. I admire the Tibetans and was happy to find these beads last year at Bella Beads in New Hampshire. They are clay beads made by the monks to help support the monastery; an image of Buddha is imprinted on them. What I like the most is the maroon paint which is the color of Tibetan Buddhist monks’ robes. The added gold paint symbolizes the sun which has a deep spiritual connotation for Buddhism (and has nothing to do with its Western connotation of wealth). Buddhism is the religion of peace, compassion, strength and wisdom. 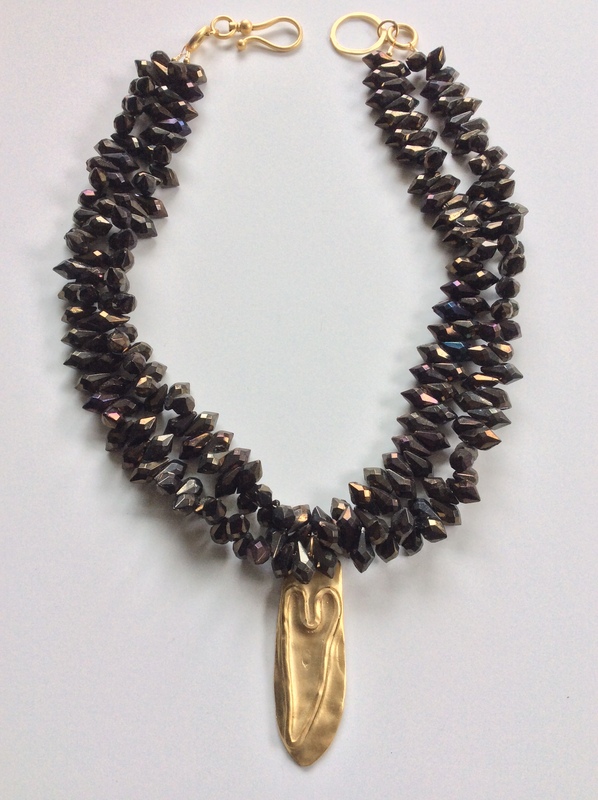 The necklace also contains matte black glass beads from India. It is 18.5″ long and comes with matching earrings. $135. It weighs 5.2 ounces. (1) Mary Taylor Simeti moved from New York in 1962 to Palermo and fell in love with the terra and with Tonino Simeti. She raised two children and cooked her heart out. Son Francisco lives in San Francisco and designs wallpaper; daughter Natalia manages the family farm and vineyard. I enjoyed her delightful memoir, “On Persephone’s Island”, while traveling. (2) You too can enroll at the Anna Tasca Lanza cooking school. Just google it. (3) There are specialized guides who usher small groups through the market. Apparently there is a global ranking for street food; Palermo, Sicily is #5. I remember sitting on the curb in the financial district of Singapore, eating delectable street food. I wonder where they are in the rankings? They hose the street down daily. Hong Kong had lots of street food lean-tos, but please don’t sit on the gross curb. (4) I have to mention the “national” red wine of Sicily since it is very good. Nero d’Avola. I found it near me fairly easily. This is the longest blog I have ever posted…hope you made it this far! If so, thank you! My Chinese Apothecary Chest: in 1994, it arrived via container to California from Hong Kong, where I discovered beading during my husband’s ex-pat assignment. Serves as the repository for my beads. Handcrafted. It has 52 Drawers, mostly sorted by color. I took this sweet necklace out of order three drawers ago because it would have been the third green necklace in a row. So, after a short break, here is the notable peridot, August’s birthstone. Early in the Earth’s solidification as magma cooled to form rock, peridot was born. When magma cools slowly, large and clear specimens are created. These large chunks were originally thought to be emeralds…sorry, Cleopatra, your prized necklaces were probably peridot! Today there are no large specimens to mine (except in Burma, and they are blocked from export by the military junta). The Pharaohs of Ancient Egypt liked peridot so much, they called it the “gem of the sun”. They also had the monopoly on their gem since it was exclusively mined in Zabargad—an island offshore in the Red Sea shrouded in fog. I read the island “went missing” for several centuries—that thought makes me smile—until 1905 when the mines started up again, unfortunately terminated in 1958 by nationalization. I love the green tones of peridot. It is classified as a silicate mineral and the less presence of iron in the rock, the deeper the green and the more slowly it cooled 3.5 billion years ago. Also only stones above 5 carats are dark. Light ones such as those I use are under 3 carats and found in Arizona, among other places. When walking on the lava beaches of Hawaii, do you notice the sand sparkles? The twinkly grains aren’t sand, but tiny bits of peridot! Lava is magma! With all these fascinating stories about peridot, you won’t be surprised to learn it has strong magical powers! It dispels fears of darkness and nightmares. This is perhaps due to the fact peridot in its natural environ shines in the dark. It also attracts love and calms anger. 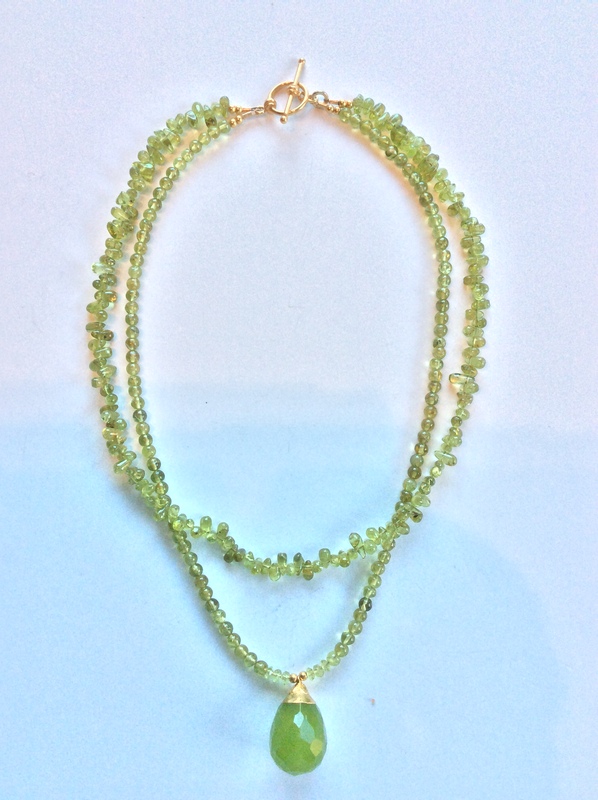 This two-strand necklace features color-matched peridot: one strand is round; the other features small briolettes with some chips at the end. I added a faceted peridot briolette with a vermeil* bail, seed beads and clasp. Wear your favorite gold earrings with this necklace which measures 18”. $99. *Vermeil is gold plate over sterling silver. My Chinese Apothecary Chest: in 1994, it arrived via container to California from Hong Kong, where I discovered beading during an ex-pat assignment. Serves as the repository for my beads. Handcrafted. It has 52 Drawers, mostly sorted by color. Twenty years ago, at the San Mateo (CA) Gem & Bead Show, I noted a large bag of sparkling metallic beads sold by the pound. I was impressed that they were labeled as “1890’s glass briolettes made in France”. I said I would take the bag. The vendor said “That’s $50.” I told him I would think about it. $50 was a lot of money to a beginning beader. But I was a Francophile also, having lived in Paris for a year after college. I quickly returned and paid for my exciting find. The 1890’s were La Belle Époque in Paris and ladies wore outlandish hats, so I figured these beads were used in the millinery trade. Milliners, largely female, were the “queens of fashion” in that era and thus could dictate the next trend, charge high prices, announce the next novelty, charge high prices, ad infinitum. There were about 1000 milliners. Supporting them were 24,000 fleuristes who made the flower adornment, as well as many plumassiers who worked with bird feathers. These women, especially the milliners, were befriended by artists and accepted in high society. Degas painted 27 known canvases where the hat captured the viewer’s eye. Recall also that the character Mimi in Puccini’s “La Boheme”, premiered in 1896, was a fleuriste. Coco Chanel, born in 1883, became a licensed milliner in 1910. Alas, the millinery fashion rage turned into a sensitive subject when it became known how many birds were killed for the sake of a hat. Then the outbreak of World War I in 1914 changed the world and millinery was no longer necessary for everyday life. Beads like these briolettes played a very small role compared to flowers and feathers. But I am happy to have made this two-strand necklace and still have a lot of them left in Drawer 28 for future projects. A briolette is an elongated pear-shaped gemstone cut with triangular facets and top-drilled to hang like a bead. They are quite brilliant, reflecting light from any angle. To add to the bead’s sparkle, I found a gold-plated clasp and heart centerpiece last November in a memory-lane visit to the San Mateo Bead Show while visiting Sandra in San Jose, CA. The necklace is 21” long and $129. Sandra claimed it for herself as soon as she saw it! 2017 Necklace a Week CHALLENGE: from 52 drawers of beads, create a unique handmade necklace using only the beads from one drawer at a time. These large (1″ around) mottled gold Venetian glass beads will make any complexion glow! They are hand-blown thin clear glass with splatters of gold. The centerpiece is a Nautilus-inspired shell in cranberry color with gold flecks which turn iridescent in the light. It is an artist-made lamp work glass bead. Other spacer beads are glass with gold foil inside. Secured by a gold metal clasp. These Venetian beads are lovely to look at and wear, but please, handle with care since they are fragile. Don’t drop the necklace and don’t wear dangle earrings that are long enough to hit them as they swing from your ear. Truth in advertising now satisfied, don’t lust for this necklace unless you like attention because compliments will be endless! I guarantee it or refund offered! Wear it with your own gold earrings. Title: Romance Retold. Length is 18.5″. $99.00. I will accept commissions combining your favorite brooch, contemporary or family antique, with my orphan pearls and appropriate other beads, probably seed beads and crystals. The cost would be approximately $139. We can exchange photos of your brooch and I’ll give you a firm quote. Time for something different! This is a beautiful Beadleful necklace and I am not ashamed of my pride because every time I wear it, I get many compliments. I shall tell you its story because I would like you to have the opportunity to have one of your own. Over the years, when pearls, the freshwater variety I love to use, wouldn’t fit through my regular beading wire, I put them in a jar. Around the same time, I acquired this colorful brooch that my friend, Kyung and I bought in Christian Lacroix’ shop in the exclusive Carleton Hotel on La Croisette in Cannes. While we browsed, our husbands waited outside by the sea, watching the bathers. Needless to say, they weren’t bored. We each found an irresistible brooch featured in Lacroix’ end-of-season sale. I used to wear mine to work on my suit lapel–so 1990’s. Fashion changed; I retired; the brooch went into my drawer. Around 2010, my last year in California, I put the orphan pearls and the neglected brooch together. The pearls are of all sizes and shapes, drawn randomly from my stash, but strung on finer than normal bead wire. I used Japanese glass seed beads, fine and shiny, as well as crystals to add interest to the pearls. It takes five strands at a minimum to look good! I made an investment in a real gold or sterling silver clasp because this is a personal heirloom. And I can do the same for you. I will accept commissions combining your favorite brooch, contemporary or family antique, with my orphan pearls and appropriate other beads, probably seed beads and crystals. The cost would be approximately $139. We can exchange photos of your brooch and I’ll give you a firm quote. There’s only one disclosure; you must be aware that the fine bead wire I use means it’s fairly fragile, so handle with care. Caption: This 18” long necklace of pearls and a favorite brooch is a show-stopper. 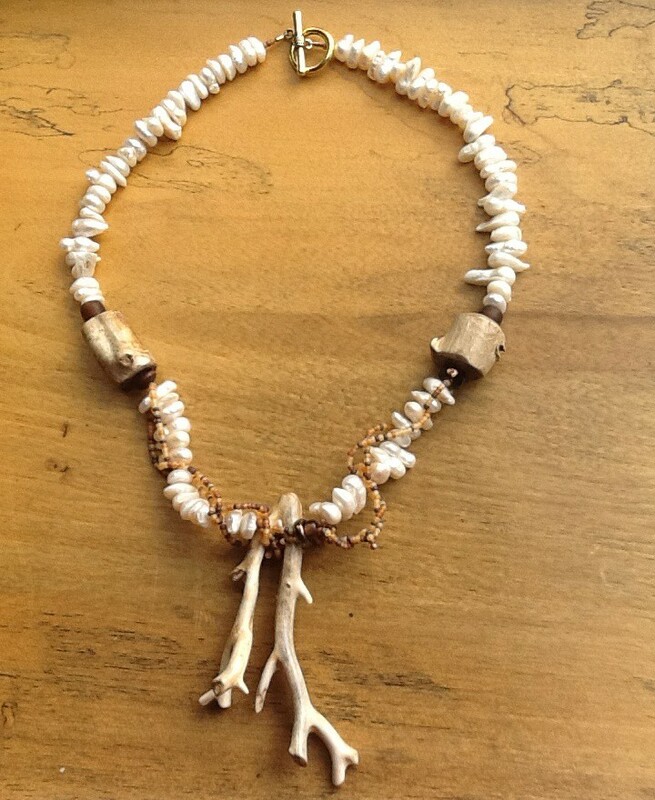 Petrified bleached wood with large baroque pearls, and beige multi-toned glass seed beads woven in and out of the wood. About 21”, with a pewter-based gold-coated clasp; can be worn casually or dress-up.It is a statement piece! The price of $175 includes shipping and insurance. Can you believe it was over ten years ago that I bought several pieces of petrified bleached wood from Alaska at the big fabulous bead shows I used to go to at San Mateo, CA? Can you believe that I’ve held these precious commodities until now? What is it when something is so precious to us we are afraid to use it? Think of your grandmother’s crystal; your child’s first Mother’s Day gift purchased with his own money; that expensive designer blouse we splurged on? That is how I classified my petrified wood….until now. Here it is, magnificent in its paleness, pure in its organic forms, and sustainably repurposed into adornment that we can wear and enjoy! I have removed it from the rank of precious and transferred it to attainable. Such a transformation! 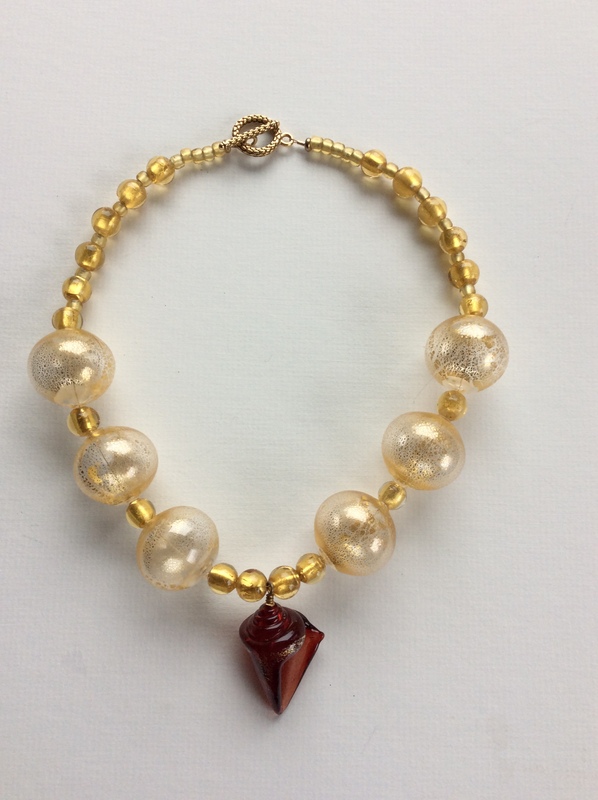 I have paired the petrified bleached wood with large baroque pearls (read interesting and organic shapes), and beige multi-toned glass seed beads woven in and out of the wood. The necklace is just shy of 21”. It has a pewter-based gold-coated clasp and can be worn casually or dress-up. Just remember, it is no longer precious; it is now a statement piece! The price is $175 which includes shipping and insurance. Fall is slipping by as I bead, bead, bead! I’m thrilled to share the news with you that I have been well-received by new collectors and bead lovers in Hull and surrounding South Shore towns! I sincerely thank all my visitors and buyers who stopped by during the July and August Open Studios. You helped me realize that one can start over! 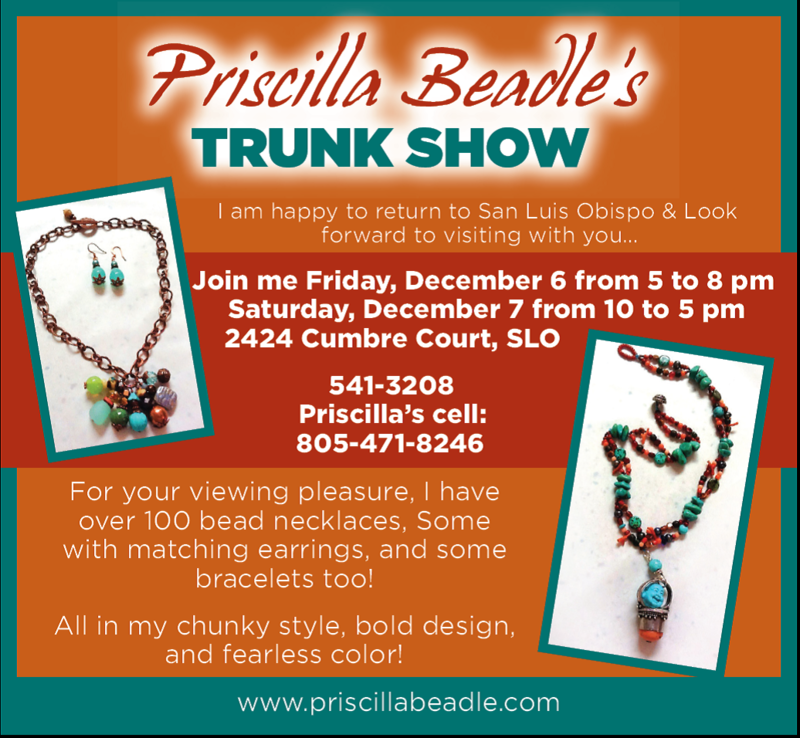 Life is still bi-coastal for me as I prepare for my second annual Jewelry Show and Sale in San Luis Obispo, on California’s beautiful Central Coast. Come to the show December 1st and 2nd, 2012, at the home of Kathleen Wilson. Pertinent news will be emailed to my California collectors. For immediate info, call me at 805-471-8246. Massachusetts collectors can attend my first annual East Coast Jewelry Show and Sale on December 9th , 15th and 16th from 12 to 5pm at my home studio in the picturesque Hull Village. For men only, I’m offering a special shopping day at my home studio, Saturday, December 8, from 12-5pm. Time to get a wish list started! Ladies, call me at 781-925-0484 if you want to come over and wish! This year, I have designed more than 100 bead necklaces and bracelets, and some earrings too. They came out fabulous, in a wide range of colors, with lots of my trademark chunky creations! But I also used smaller beads, made a variety of lengths, and I’ve started making earrings for those unique necklaces that don’t call for silver or gold earrings. I have something for all my discerning friends and collectors. “Chic Thrills” features a charming koi fish centerpiece I have had for a long time, waiting for the right mix of beads to show it off. Well, when nearly matching vintage orange Lucite (what plastic was called in the 1960’s) beads came into my possession, I had the answer. But what contrasting color to use? An odd green, don’t ask me why. I was so excited by the time I assembled the large faux pearl, the beetle wings and the small faux pearls, that I can’t remember how the colors all came together! The fish is Asian in its origin as indicated by its large popping eyes and its elaborate tail display. It is a vintage piece perhaps made of resin with lots of nice carving marks on it. The five beetle wings are iridescent and pointy and most unusual. A great conversation piece. 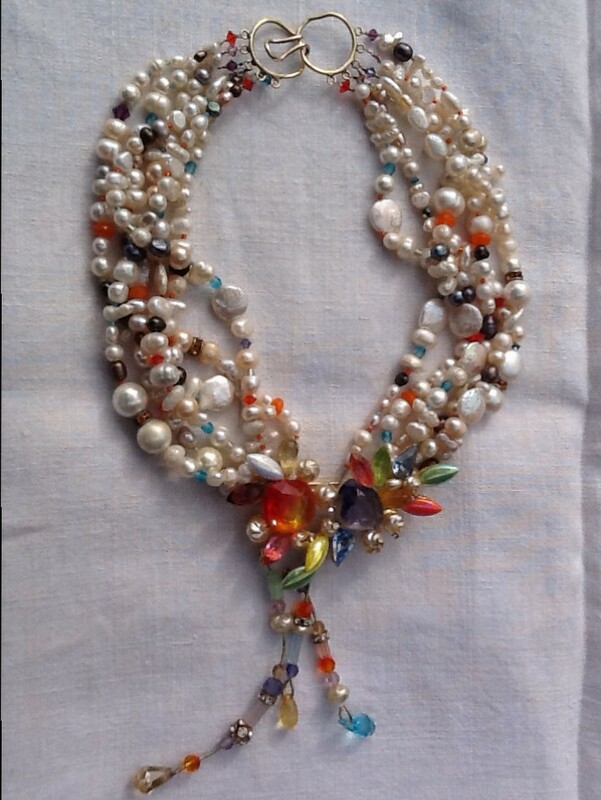 The necklace is almost 19″ long and the centerpiece dangle is 4″long. Hammered gold-colored metal clasp, gold-filled wire connections in the dangle. 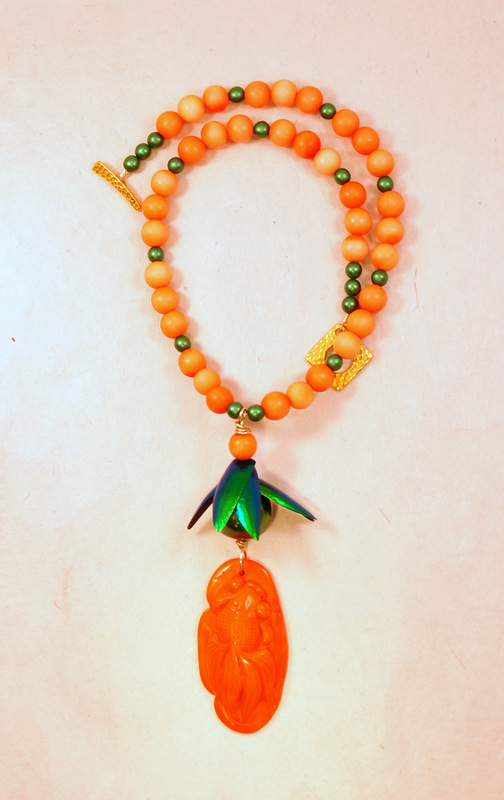 The price is $159 which includes earrings featuring green and orange beads with a beetle wing. “A Smashing Good Time” is a classic sterling silver and turquoise necklace with a contemporary spin that the silver used here is a special basket weave pattern mastered by the Hill Tribes of northern Thailand. The clasp is also sterling silver by the Hill Tribes. The turquoise chunky beads mix smooth and veined specimens of Chinese-mined turquoise stones. The necklace is 23″ and the basket weave medallion is 2″ in diameter. It is priced at $135. 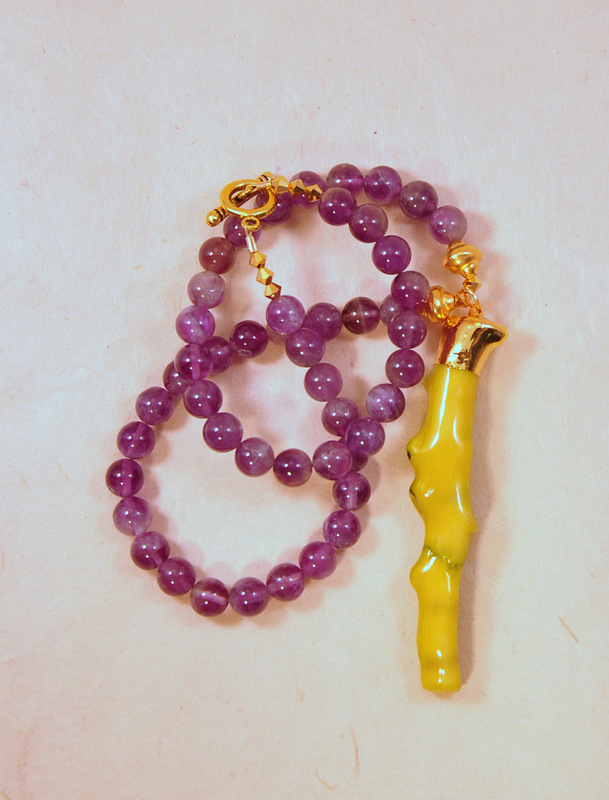 “Flash Forward” is also color-forward: semi-precious amethyst beads matched with lime-dyed branch coral. The branch coral is bezeled with an electroplated gold bail for a shiny, blingy look. It is attached to the amethyst necklace and secured by two vermeil (gold plate over metal) beads. The necklace ends with more electroplated gold beads and a gold metal clasp. Think of this piece as a fabulous good luck charm and wear it well! The necklace measures 18″ and the centerpiece is 3″.